Today I want to share a delicious cornbread recipe with y'all. Now this isn't your regular cornbread by any means, but cornbread with a twist instead. You see down here in Texas we like things a little spicier than most folks, so we love adding a little heat to our cornbre ead. The ingredients for this cornbread are similar to Mexican Cornbread, but this recipe uses Velveeta Pepper Jack and jalapenos which makes a tasty combination. If you're not a big fan of spicy things then I recommend leaving out the jalapenos and just using the pepper jack cheese. I have made this recipe twice once with Velveeta's pepper jack cheese and the second time with the Mexican mild. I had to use the Mexican Velveeta because the pepper jack Velveeta is hard to find in the grocery store, so if you happen to come across it take it from me and buy it because they are really scarce. I got this recipe from Rachel at A Southern Fairytale. Rachel is one of my fellow Velveeta Kitchenista and this was her original recipe submission. This cornbread is quite tasty to say the least and goes perfectly perfectly with a big pot of chili, pinto beans or even soup. I hope you will give this cornbread a try because you can't have too many cornbread recipes. Mix all the ingredients together and pour into a 13 x 9 inch baking dish sprayed with non stick spray. Bake at 425 degrees for 30 minutes. Cool in pan and slice into 12 equal squares. This cornbread is like a thick, moist, spicy cake. It is delicious served hot and drizzled with honey. Cook's Note: If you do not like Velveeta you can substitute by using 12 ounces of regular pepper jack cheese. I LOVE cornbread, especially spicy cornbread! 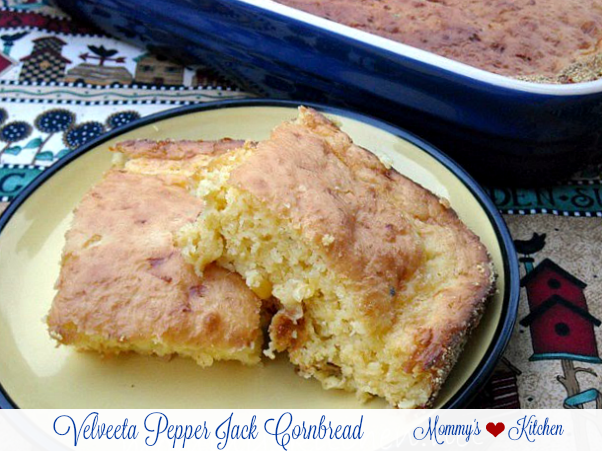 I love spicy cornbread too, this looks like a great recipe. Thanks for hosting! Sounds like an excellent recipe. We LOVE jalapeno cornbread. My husband absolutely loves spicy cornbread! I am going to have to make this for him soon ;) Great recipe! Being Texan myself I truly appreciate this cornbread!!!!! Now add some Cowboy Caviar and you have a meal! You are right...a big pot of beans and some spicy cornbread! Yum. Love it! I have never seen the pepper-Jack version- sounds great though- one of my favorite cheeses! Love the cornbread! I don't think that I can get this special cheese over here! Mmmm... I've been craving cornbread. This looks lovely! Thanks for posting this. It looks REALLY good! I'm in love with this cornbread...yum! I had no idea that Velveeta made a pepper jack version. It sounds great! We love corn bread in my house. I bet my family would like the spicy kick to it too. Thanks for the recipe and linky! Have a great week! has anyone noticed this recipe does not include butter milk or milk! are we supposed to assume you have butter milk or milk? It always amazes me that when people choose to be rude they post "Anonymously". So to answer you rude comment you are the only one that noticed, because there is no milk or buttermilk needed in this recipe. I omitted the peppers & added about a cup of baco-bits.